WASHINGTON - The US Defense Secretary James Mattis pushed back on the idea of privatizing the war in Afghanistan on Tuesday, weeks after US President Donald Trump's national security adviser appeared to leave the possibility open. “When Americans put their nation's credibility on the line, privatizing it is probably not a wise idea,” Mattis told reporters during a rare appearance in the Pentagon Briefing Room. Mattis was joined by Chairman of the US Joint Chiefs of Staff Gen. Joseph Dunford. “In South Asia, we continue to work by, with and through allies and partners in pursuit of peace, and two additional countries have now joined the NATO-led campaign in Afghanistan as partner nations. That's United Arab Emirates and Qatar. And 32 of the 39 nations which have already committed forces to the mission agreed to either increase or sustain the current force levels through 2019,” he said. Mattis said the US is fully supporting an Afghan-led and Afghan-owned peace efforts. 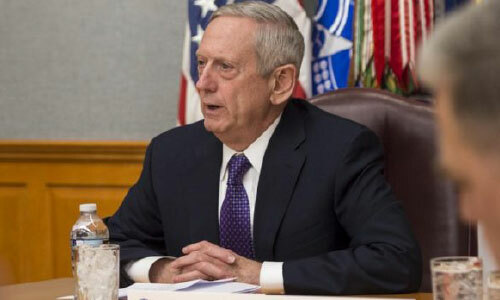 “We are fully supporting Afghan-led and Afghan-owned reconciliation efforts, and hard fighting is going on to convince the Taliban they must negotiate,” the US defense secretary said. “A recent statement by a Taliban leader made specific mention of negotiations as a way to bring, and I quote here, "an end to the war," unquote. This one of the most forward-leaning statements made yet by a Taliban supreme leader, even as they conduct attacks designed to garner press attention, costing lives, and they are now stripped, however, of any religious guise for an inhumane campaign against the Afghan people,” Mattis said in his chat with reporters. Earlier this month, John Bolton, the US president's national security adviser, was asked whether private contractors could replace US forces in Afghanistan. NBC News reported that Trump had shown interest in the idea, which had been proposed by Blackwater founder Erik Prince. The report said that in an interview with ABC News' Martha Raddatz Aug. 19, Bolton wouldn't say whether Trump was still considering it. "There's always a lot of discussions," Bolton said. "I'm always open to new ideas, but I'm not going to comment on what the thinking is. That will ultimately be the president's decision." Prince, who now heads Hong Kong-based security firm Frontier Services Group, is the brother of Trump's education secretary, Betsy Devos. While Prince has advocated for the use of private contractors in Afghanistan before, his renewed efforts to gain traction for the proposal are tied to the one-year anniversary of the Trump administration's new strategy for America's longest war. At a press release following the NBC News report Aug. 20, Prince called the Pentagon's plan for Afghanistan "a total failure." In the same press release, Prince outlined a plan involving a blend of private contractors and US special forces who would mentor Afghan battalions in much the same way the US is currently training, advising, and assisting Afghan troops. Prince denied he was proposing a privatization of the war. Prince said in the same statement that the operation would be "fully accountable" under the Uniformed Code of Military Justice and the Afghan government's rules of engagement. He also estimates the need for only 6,000 contractors and 2,000 US troops, compared to the approximately 14,000 Americans who are currently deployed.